John Crawford III went shopping at WalMart. John Crawford III was going to buy a pellet gun. He picked one out. He called his girlfriend on the phone and was chatting casually. He was shot dead by a policeman before he reached the checkout line. He was black. The officer who killed him with two rounds from an AR-15 was white. According to both a grand jury and a special prosecutor appointed by Ohio Attorney General Mike DeWine, no crime was committed other than a man shopping while black. DeWine had refused to release the store surveillance video (above) to the public prior to the grand jury being empaneled, claiming that would contaminate the jury pool. Crawford's family had seen the videotape and claimed that DeWine had promised to release it. This did not stop the special prosecutor, Mark Piepmeier, from showing the video to a key witness prior to the grand jury, enabling that witness, Ronald Ritchie, to possibly change his story. Ritchie, who had also claimed he was a former Marine, called 911 to report Crawford waving a gun around the store and acting threatening. Richie was released from the Marine Corps after seven weeks service for “paperwork problems.” He had been discharged for concealing a heart condition on his enlistment paperwork. John Crawford's murder was not the first case of a police killing of an unarmed young black man where Piepmeier has failed to gain a conviction. In 2001, he did manage to get a grand jury to indict a Cincinnati police officer for shooting a black teenager, Timothy Thomas, in the back over an unpaid seat belt ticket. When Piepmeier, then-Hamilton County Prosecutor, brought the case to trial he did not gain a conviction. The death of Timothy Thomas caused a week of clashes with police in Cincinnati where widespread police brutality was reported and the teenager's funeral procession was attacked by police. Piepmeier's role as a prosecutorial fixer goes back further, to the trials following the Lucasville prison uprising. He gained death sentences for multiple defendants who are now appealing, yet ordered evidence, including the murder weapon, destroyed before the appeals. Attorney General Mike DeWine has had his office intervene in the investigation of a controversial police shooting. As the Free Press previously reported, state investigators failed to note serious misconduct that led to the suspension of a ranking Greene County Sheriff's deputy during a fatal standoff. That deputy was later fired and now faces multiple federal indictments on firearms charges. The deputy, former Major Eric Spicer, previously ran for Congress in Greene County for a seat previously vacated by DeWine's cousin, Kevin DeWine. Mike DeWine is from Greene County and his daughter is a county prosecutor there. Crawford was killed in her jurisdiction. Crawford can clearly be seen in the video pointing the pellet gun at the ground and doing nothing but talk on the phone as numerous other shoppers paid him no mind. 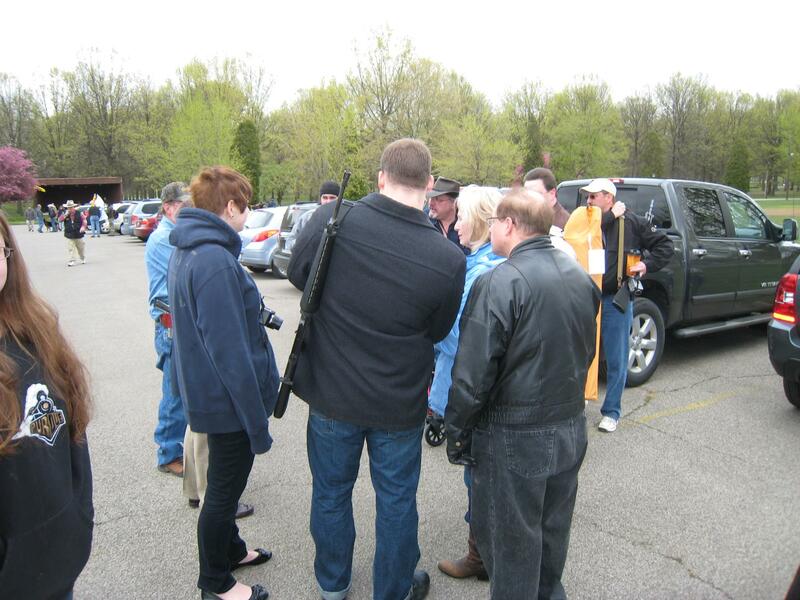 Had Crawford walked into Walmart with a loaded assault rifle slung over his shoulder, like the white people at an open carry rally (below), he would have not been breaking Ohio law. Thus, he was clearly well within his Second Amendment rights to purchase a varmint gun and loiter on the phone. As can be seen in the video, he was essentially shot on site while unaware and threatening no one. The only differences between a black man in a Walmart and the white men at a rally are skin color and real weapons. At the time of this writing, activists are undaunted, and are meeting about the next steps to be taken in at least one church in Dayton and one in Columbus. The Ohio Student Association, a statewide youth-led organization building power for social, economic and educational justice will be having an event Wednesday, October 1 at the Omega Baptist Church in Dayton at 6:30 pm. The group previously sponsored an 11-mile walk from the Walmart to the courthouse that arrived Monday as the grand jury proceedings were scheduled to begin. The group had previously demanded the indictment of the two officers involved in the shooting, the release of the videotape and for United States Department of Justice to take over the investigation. Despite the demands of both the family and community activists, the videotape was not released until this morning, Wednesday, September 24. The officers have not been indicted and Attorney General Eric Holder has issued no comment. Both DeWine and Governor Kasich have met with community leaders to urge calm in the hopes of forestalling protests which would take place during election season. The Free Press will continue to cover this issue and the protest events around it as they develop.